Glass tile has been an excellent component for the homeowner to use in many aspects around the house. Some use it for walls, some for flooring, while others prefer to accent backsplashes and showers with this amazing product. If you’ve never had the opportunity to dive into the details about this material, we invite you to do so now, as we share some of the details and uses here with you today. At Boulevard Flooring Emporium, we offer an extensive line of these tiles from which to choose. No matter what you’re looking to accomplish, we can not only help you find the perfect product for the job, we can help you design and install it as well. We invite you to stop by our showroom, located in Lancaster, California, to see these tiles for yourself and decide which one best suits your needs. We also serve the areas of Lancaster, Palmdale, Acton, Rosamond, Tehachapi, Littlerock, Pearblossom, Mojave, California City, Santa Clarita, Leona Valley, and Lake Elizabeth. Glass tile is not simply clear, shiny glass, like a window, as some people tend to believe. In fact, there are thousands of finishes available including opaque, reflective, colored and so much more. What’s more, the finish can be roughed up a bit to give the piece an entirely different look, especially nice to use as an accent. Other finishes that are sure to please include the frosted look, bubble glass, cast or slump tile. You can look for glass to be present in upcoming home décor trends, as it only continues to become more beautiful and useful with advances in technology and manufacturing. This material is probably one of the most versatile in home décor. Any room can be improved with the addition of these tiles. You might just want to accent your kitchen backsplash, but thinking outside the box might lead you to use them on walls, along the floor, near fireplaces, or even around your swimming pool. The fact that they brighten rooms and reflect light, can all work to make rooms and spaces look much bigger as well. 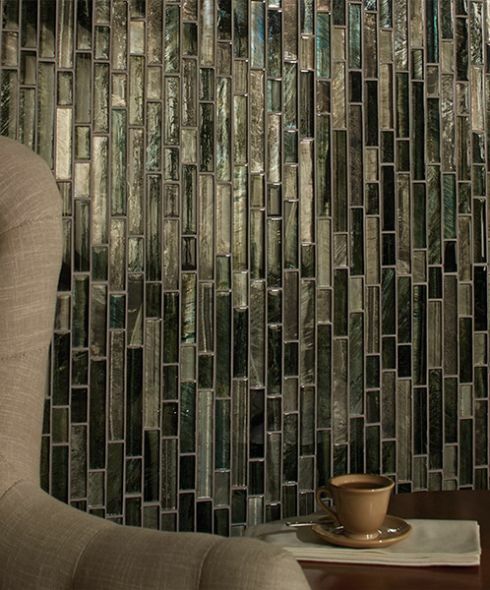 You’ll get an absolutely stunning effect by using these tiles to feature a specific wall. Some prefer to use this design in bathroom, but you can also consider it an option for family and dining rooms, or even to accent a home office space.